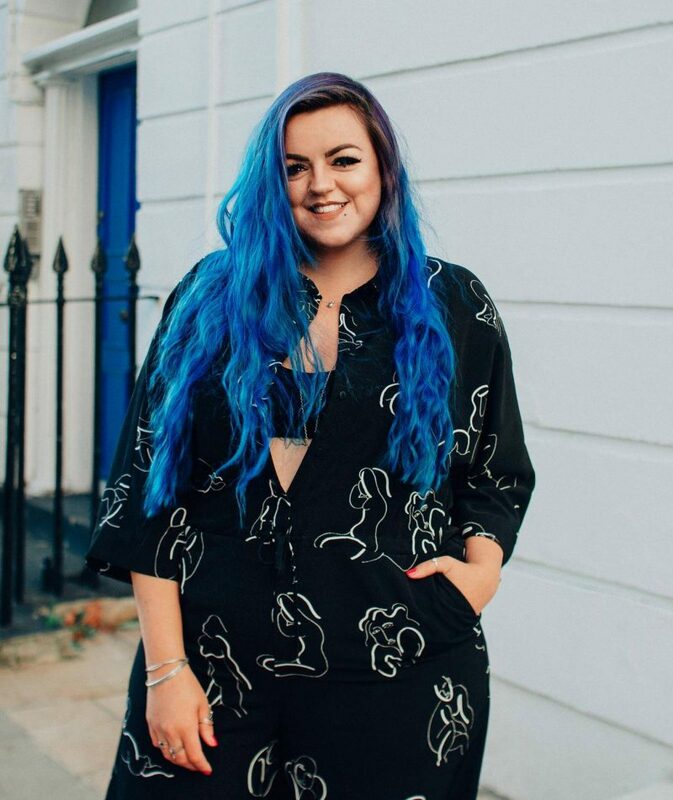 First of all, apologies for how long it’s gone without a blog post – I’ve been a very busy bee & am now in the process of moving, so life is pretty non-stop! 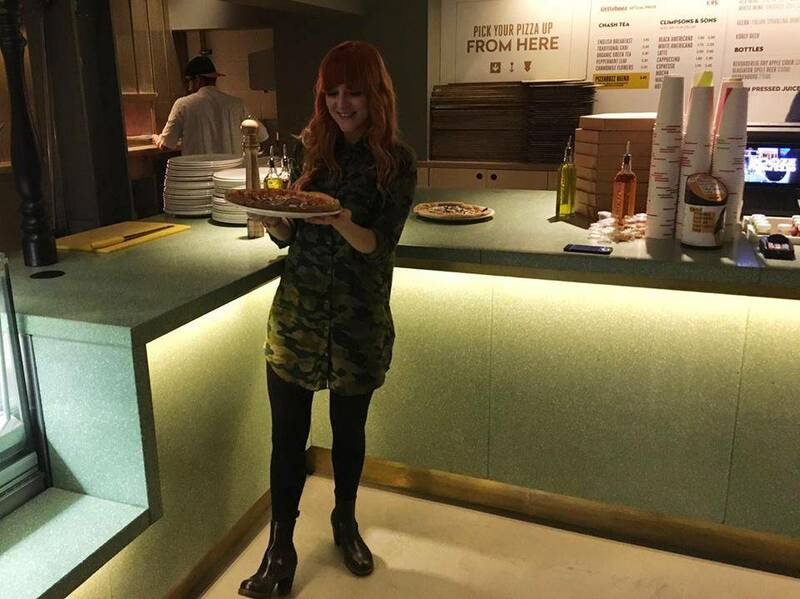 I have done a whole load of stuff since I last posted, but first of all I have to tell you about the incredible pizza I made at PizzaBuzz in East London last week! My +1 (Lauren who you will have seen pictures of in my Ice Bar blog post) and I headed to PizzaBuzz not having been before, but aware that there was going to be pizza, in a sort of “build your own” type scenario – cue me picturing the night ending with a selection of vegetables in my hair; However we weren’t the ones physically making the pizza, the hospitable and friendly staff were actually the ones doing the making, whilst we picked which base & toppings we would like. 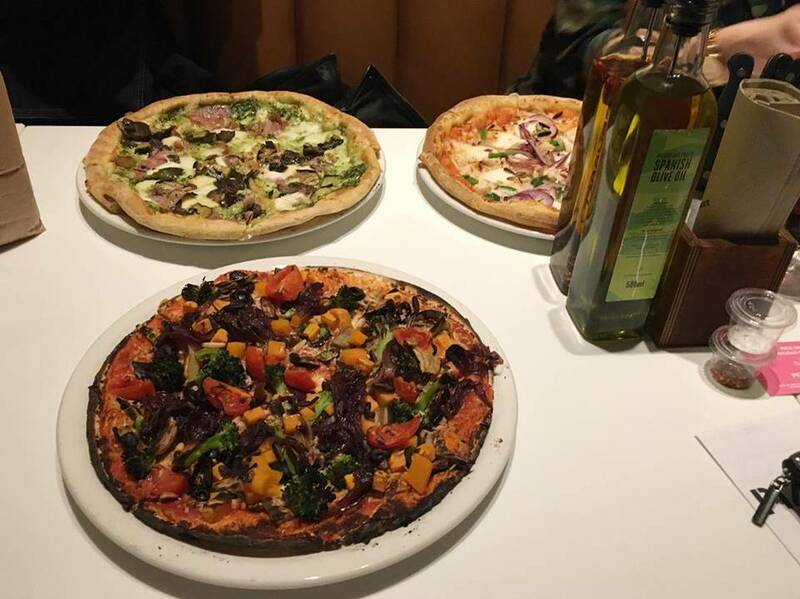 Lauren is coeliac, and you may have remembered me mentioning once or twice that I’m vegan, so we were pretty pleased that gluten free bases were available, as well as a Vegan cheese that the staff spoke very highly of. 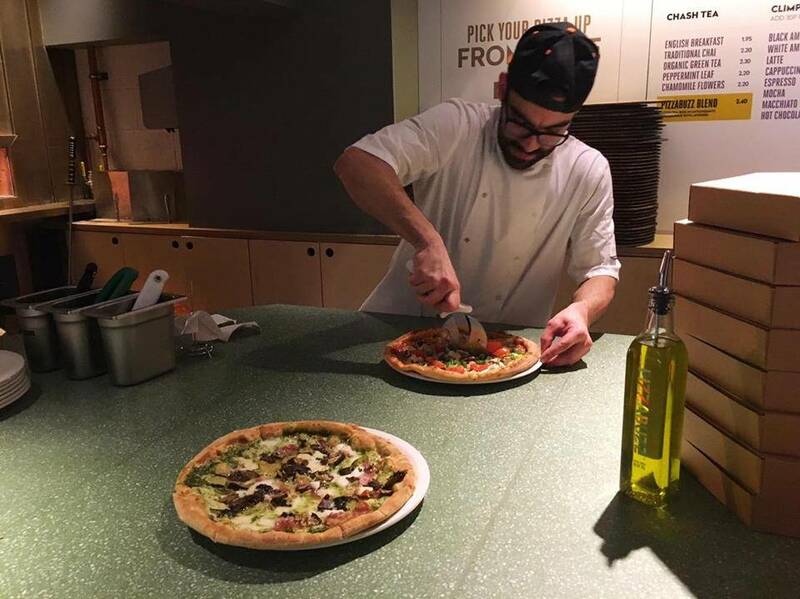 The regular pizza bases are made using a special blend of flour made with spelt, before being cooking in a wood-fire oven. Click here to check out the full menu & list of the extensive toppings available! The topping choices were incredibly extensive and I got slightly over enthusiastic when my pizza was being made. In the end I opted for a Gluten free base with: vegan cheese, black olives, broccoli, red pepper, butternut squash, garlic cherry tomatoes, sweet potato, caramelised onion, and garlic… Aaaand breathe. Due to overloading my pizza with all of the vegetables, it had to be cooked a little longer, meaning the crust of mine was a little crispier than the others on my table, however this didn’t detract whatsoever from how good it was. When being presented with my pizza I was a little overwhelmed at the size, before being thankful past Luisa had subconsciously prepared for this – having a small lunch, meaning there was plenty of room to finish this bad boy! In most “fast food” pizza places, finding a Vegan dessert option is incredibly limited, if not impossible, but PizzaBuzz have a lovely selection of ‘Mamoo Ice Cream’, and not only does it include three different kinds of sorbet (which I was thrilled to be offered a spoonful of each to try), there’s also an almond milk ice cream option – which I had never tried before! 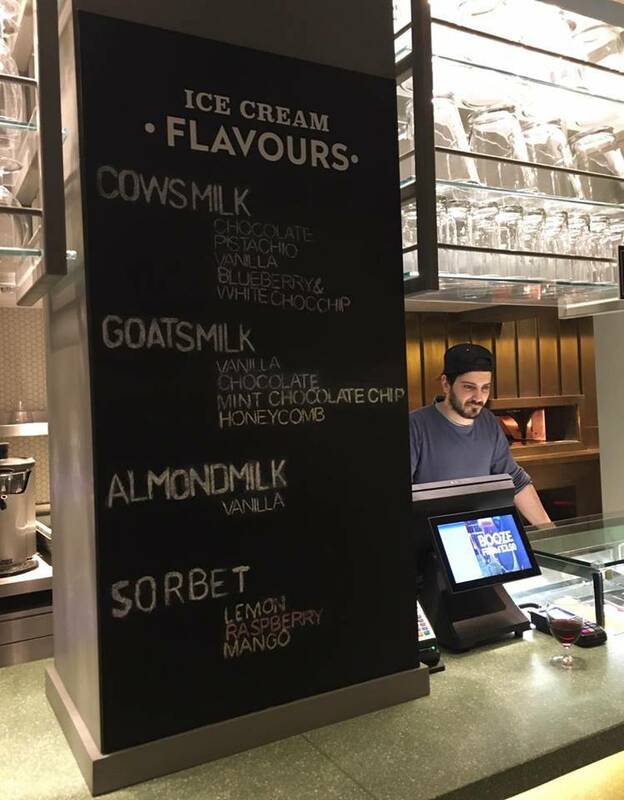 It was creamy, vanilla-y, & frankly I couldn’t tell the difference between how I remember dairy ice cream to taste – this is definitely the future of ice cream! 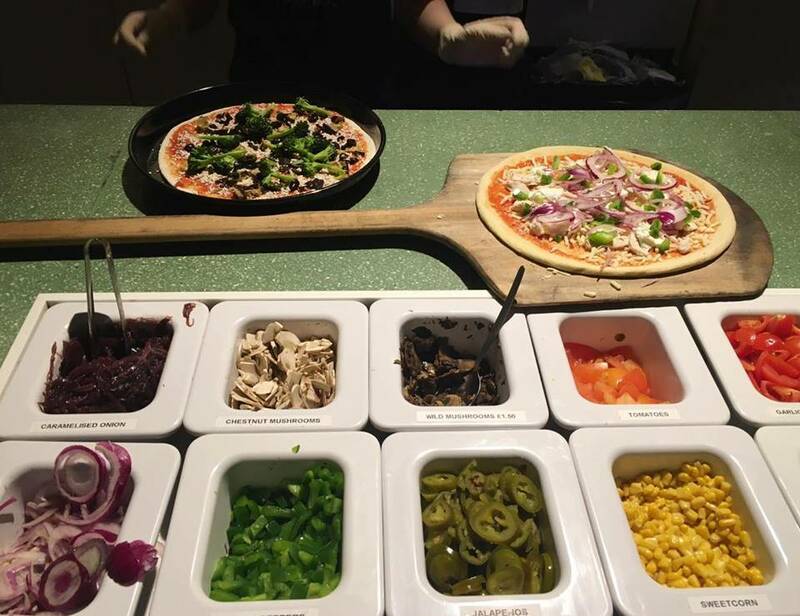 Overall I would definitely recommend visiting PizzaBuzz if you fancy creating your own delicious pizza. Prices start from as little as £4.25 (I mean really, where else can you get a whole pizza for that price, in a lovely environment in East London? 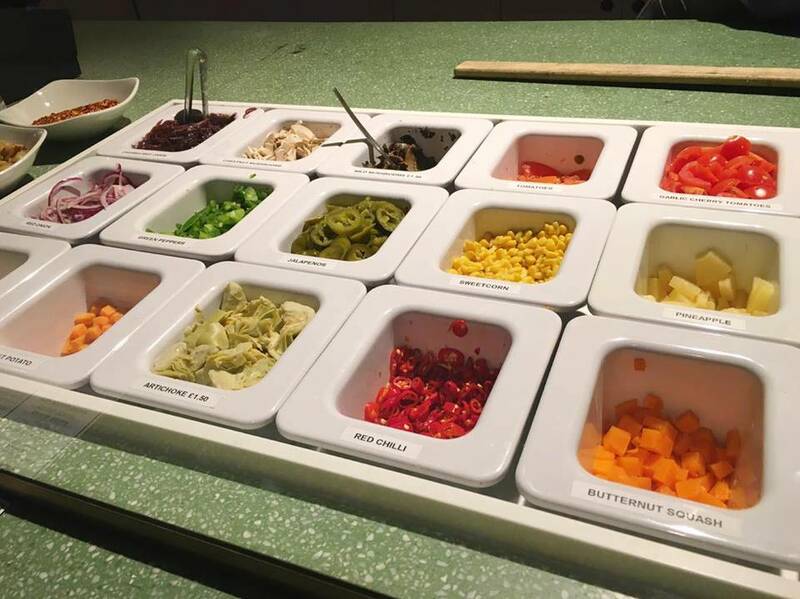 ), and go up to as much as you desire – depending on the toppings you choose. 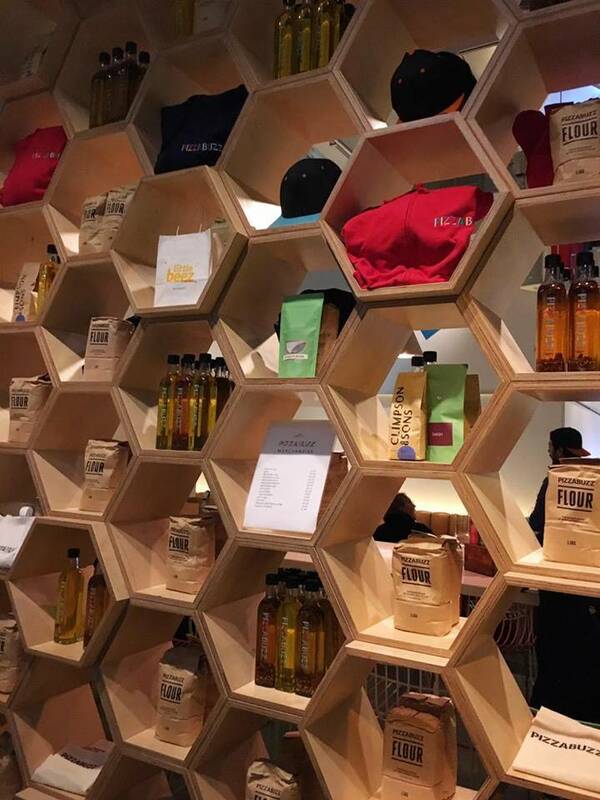 The decor is very simple & vibrant, with a honey comb theme (relating to the “buzz” part of the restaurant name) & some great illustrations on some of the walls. 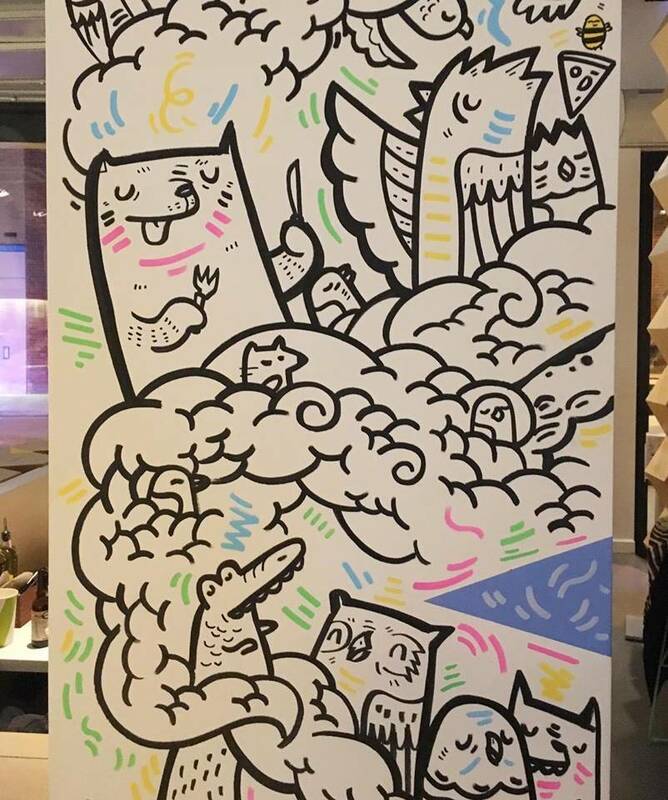 The artwork was done by a Sheffield based artist Geo Law – check out his stuff, he’s very talented! I understand they get super busy during the day, with the queue sometimes out the door for take out lunches (if you’re interested in ordering take out in advance, you can do it via the flypay app)! The evening we visited it wasn’t overly busy, but the atmosphere was relaxed and just the right amount of buzz and conversation; there was music playing, drinks flowing, and I was really pleased I was able to meet & chat with Claire (of Crumbs Food) & the lovely Lucie (of Lucie Loves) at the event – they were both so friendly & full of great blogging advice! PizzaBuzz also has a selection of kid friendly choices & deals, for those under 12, called: Little Beez! 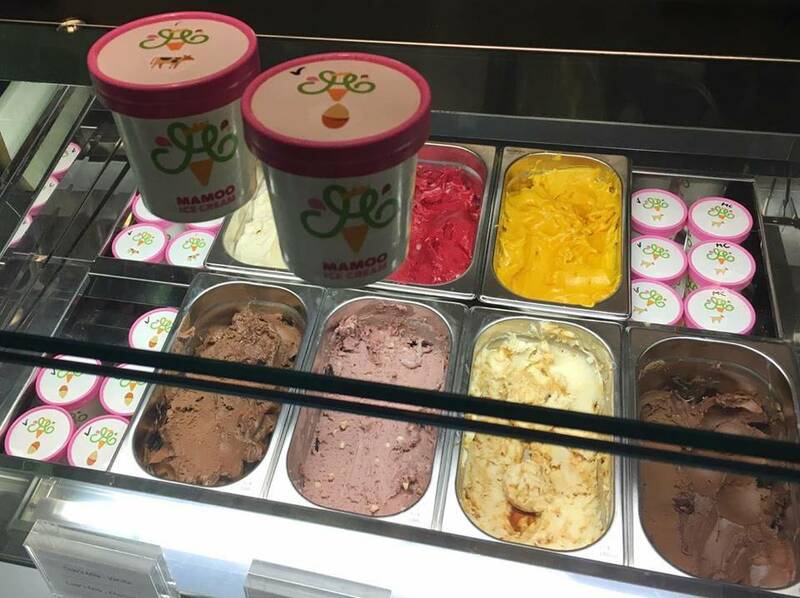 For just £6.95 ‘Little Beez’ can get a 6″ pizza, dough balls & one of the delicious Mamoo Ice Creams I mentioned earlier… If that wasn’t good enough kids also free on Saturdays with a full paying adult! I almost forgot to tell you, as if this place couldn’t get any better, they offer a #BottomlessBooze deal – from 2pm on weekdays & ALL DAY on the weekend…! Sound like something you might be into? Thought so. 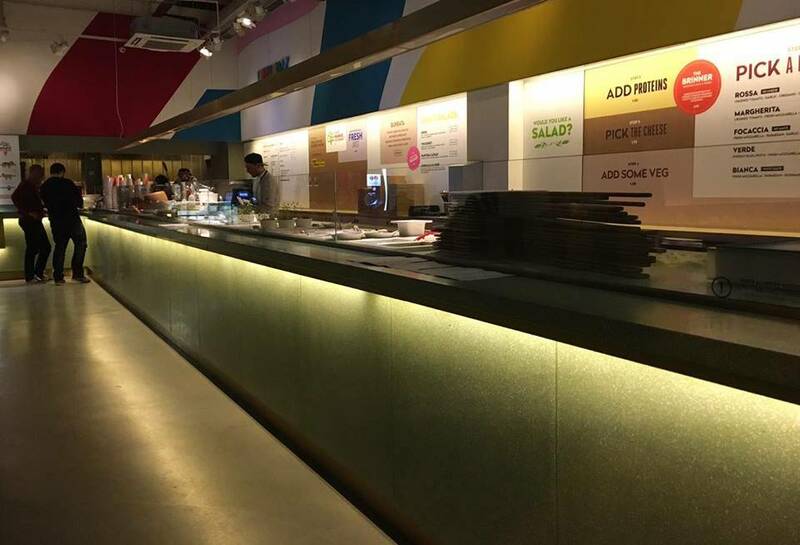 For £29.95 per person for 2 hours, you can have 1 Pizza (either a set pizza from the ‘Worship Street Loves’ section on the menu, or customised up to 3 toppings), and bottomless drinks on tap: including beer, wine (red & white), and bubbles! 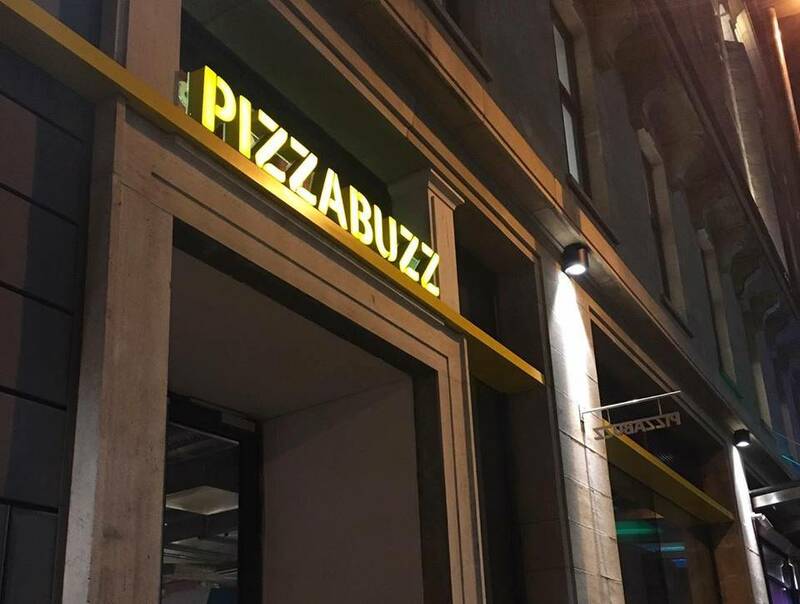 I attended PizzaBuzz for a blogger event – the food & drinks were free of charge, however all views expressed in this blog are my own. Enjoy this post? 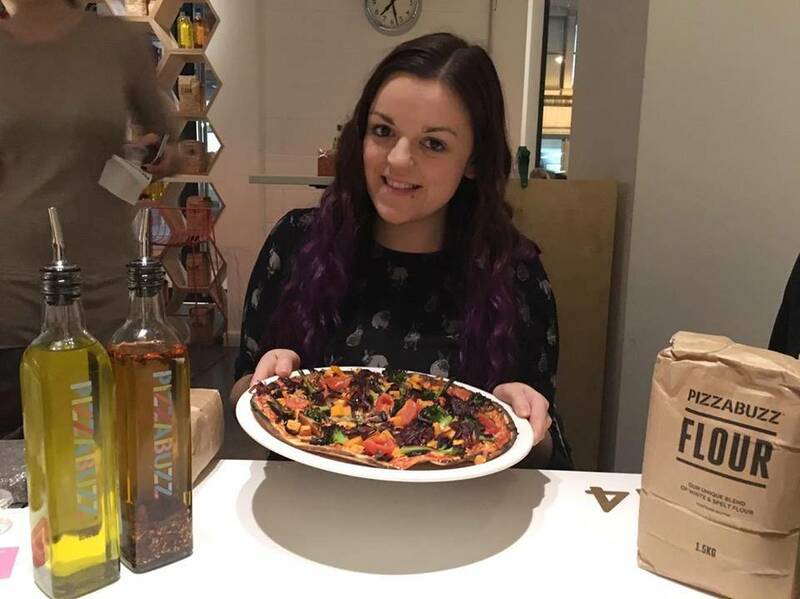 Check out the first time I tried Vegan pizza! That pizza looks delicious! So excited to have another pizza place to check out, I’m obsessed!